Graded conclusion statements for questions formulated by a group of experts on the topic. Supporting documentation, including bibliographies, search plans, research articles abstracted into formatted worksheets and quality criteria checklists. Each graded conclusion statement has a corresponding evidence summary. 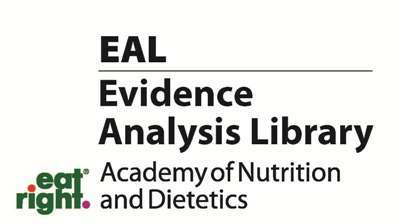 Seventeen (17) Evidence-Based Nutrition Practice Guidelines are currently published and include major recomendations with corresponding rating of evidence strength and clinical algorithms showing the flow of treatment for a specific disease or condition. Active members of the Academy receive free access to the EAL. Please log into the EAL via the Academy's website (www.eatright.org) or by clicking on the words LOGIN in the upper right hand corner and entering your Academy login information. Non-members of the Academy can purchase an annual subscription (US$250) or a one-month trial subscription (US$50) to the EAL. Click to subscribe. For group rates or a demo of the EAL, please contact Toni Acosta at aacosta@eatright.org.